Jenn, Josh, and I had a great trip up to Washington, D. C. over Jenn’s Spring Break. 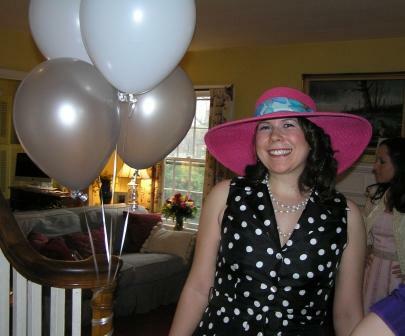 We had planned ahead for weeks so Jenn and I could attend Bonnie’s Bridal Shower. Bonnie’s shower was a “tea party” and a lot of fun with more than a dozen young ladies and the two moms, Mrs. Jones and myself. Josh was also able to join us on the trip; we spent several days in Ben’s apartment and doing things together with Ben and with Bonnie in the evenings. During the week, I posted photos of some of the highlights of our trip on Facebook (follow this link if you have a Facebook account). After we got home this past weekend, I posted a video on YouTube of when we stopped to enjoy snow falling in the mountains between Tennessee and North Carolina!! While in D. C., we went to Frontline, Ben and Bonnie’s church. We also walked around Georgetown one night and around Old Town Alexandria where I especially enjoyed lunch at Chadwick’s in a historic building near the Potomac River. What fun to view your snow day trip and to see and hear you; Sus, Mike and Jennie. This year in Washington state, we’ve enjoyed 2 cold snaps with freezing temps. and a couple inches of snow. It’s an etherial wonderland when it first falls. Your family must be a source of much delight. The Lord richly bless and keep you. Hi, from the very opposite side of the country! 🙂 Thanks for visiting and for your kind comments.